I creep down the stairs, careful to step over the squeaky step. It’s 6 a.m. and I head straight for the coffee pot. I choose my favorite green flowered mug from the cupboard and pour a fragrant cup of coffee. With any luck I’ll get a chance to sit down and enjoy my coffee in a quiet house while the kids still sleep. I love a little time just to myself to read scripture, journal, or read a book I’m in the midst of before the rush of the day begins. I reach for the sugar bowl and freeze. A cry breaks the silent morning. My toddler is up. It seems like no matter what time I choose, my little one makes that her time to rise as well. The time may even vary day to day, but it seems like she can sense the fact I opened my eyes and can’t wait to join her mama as the new day begins. It’s morning like these—that happen more often than not—that I need an easy way to spend time with God. I usually spend time with him while my baby munches Cheerios or flips through board books by my side. For now, gone are the days of more extensive study. Sometimes I need an app on my phone to read scripture while holding a child who does not yet want to be put down. Or listen to an audio devotional while fixing breakfast. Or to read from a prayer book because I don’t have the quiet enough to form my own thoughts. 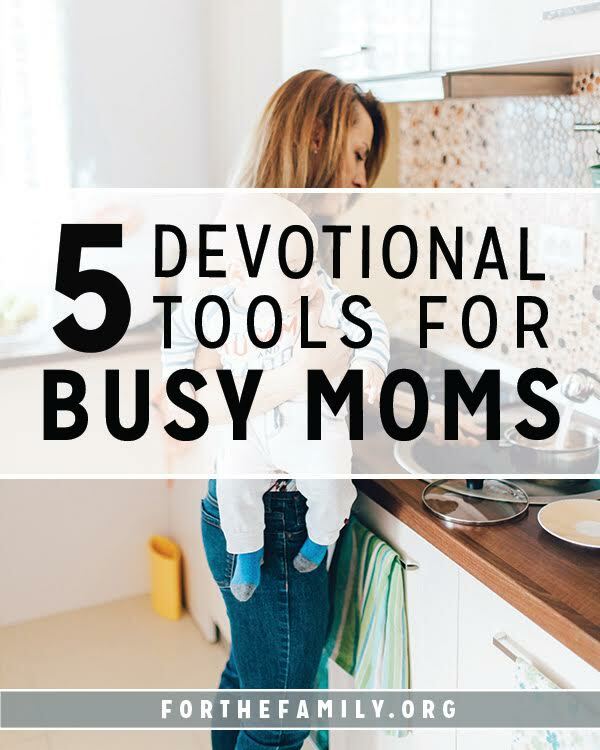 Today I'm sharing 5 favorite devotional tools for busy moms over at For the Family. And don't forget to share some of your favorites too!